Spooky Music is the perfect way to create just the right spooky atmosphere at Halloween. It can be a bit of its own trick, but when done well it is definitely a treat. Unlike other holidays where there are a plethora of descriptive songs Halloween is more of a spirit laden atmospheric thrill ride than a collection of classics and standards. So here at Exeter Science and Entertainment we have enlisted the help of a very talented young musician, Nick Francella who is a student at our very own University of New Hampshire. Nick has created for us a collection of spooky mp3’s for you to download to help you create that perfect spine chilling mood we all crave come late October. Click to listen to “Basement Ghost“. The beauty of these files is that when you couple them with the CoolStream Bluetooth Portable Speaker all you need to do is copy them onto a flash drive or SD Card and they will play for as long as your battery lasts…which we have tested at close to 5 hours. So once your Flash Drive or SD Card is ready, just pop it into your speaker and find a good hiding place. If you’re having a party inside, then behind a plant or under a table, if you have ghosts and goblins coming up the driveway for candy…well, definitely behind a rock or in a shrub. If you have a decorated porch, then by all means right behind the pumpkin or Jack-O-Lantern. Just hit play and walk away. The speaker will automatically replay the selection or selections that you have chosen to download. It is that easy. 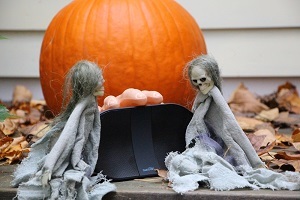 Have fun and Happy Halloween with some Spooky Music from CoolStream.